This school year was supposed to be different than last school year. What began as excitement about the new school year has slowly turned into despair because I feel like my instruction is being held hostage by my principal. Last summer I spent my time reflecting and planning for this school year. Only to return to school and have my ideas met with resistance by my administrator. At the end of the previous year 5th grade teachers realized that we needed to create a PreAP class. When we received our rosters we realized that the someone had changed the class rosters. As I listened to the conversation it was very apparent to me that our principal didn’t trust us. I have read countless articles written by innovative teachers who have encountered resistance from their administrators. I never thought in a million years that it I would be in that boat. Here I am. Needless to say we got passed his concerns however, my enthusiasm about flipping one of my classrooms had dropped to an all time low. When my co-worker approached me about flipping my math classroom for our higher level students I was all ears. Even though I knew that we didn’t really have our principal’s blessings I still wanted to try to flip my class. I had been reading articles written by teachers who had flipped their classes but none were urban educators which lead me to believe that there aren’t many urban educators flipping their classrooms. The article written by the Huffingtonpost talks about how educators in poorer districts are unable to flip their classrooms due financial constraints. This is not the case for me but there are other obstacles that I plan to encounter like the over emphasis on test preparation interfering with the launch of the initial flip. According to Cornell University Center for Teaching Excellence flipping your classroom has to be centered around moving the instruction outside of the classroom. The article recommends that teachers who want to flip their classroom start small by choosing one class to flip. My plan is to use my higher level class to flip. Instead of having to add to the lessons can be simplified for future flips. 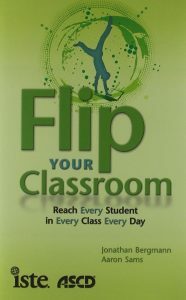 Flipping my classroom almost didn’t happen because my principal’s reaction to the whole idea. This weekend I will be creating a video to go along with my volume lesson and I can’t wait to see my students’ reactions when they hear my voice on the video for the time. This is going to be epic!